A 14 year old passionate child of God, 5 students from America, and 1 student from Dubai undertook this incredible spiritual journey with pastor Wynand de Wet (aka Wayne) to Myanmar (Burma) and Thailand from June 17-27. It was a life changing experience for the students as their adventure started with teaching to a group of early to mid twenties Karen refugee guys, who are all on fire for the Lord and attending Bible school in the Karen refugee camp close to Mae Sot in the northern parts of Thailand. They also visited several school in this area, and then crossed the river into Myanmar (Burma) to continue working with tons of kids teaching them English through Christian songs, Bible skits, fun games, and also sharing about salvation in our Lord through explaining the Evangelism colors (gold, black, red, white, green and blue) using arm bracelets. The group returned to Bangkok where they witnessed people publicly worshiping Buddha and other gods during a public evening worship session on the streets of Bangkok, but then also in some of the temples. 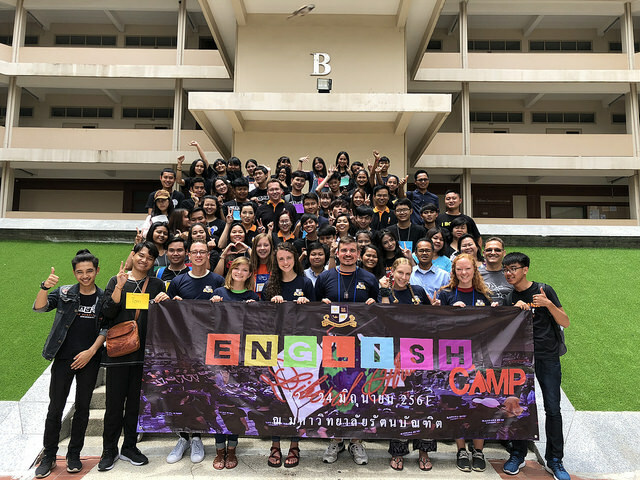 The trip ended with the highlight of this college trip: Our group of college students witnessing to college students of Bangkok using teaching English as an Evangelism tool through Christian and other fun songs, games, teaching sessions, and multiple small group breakaway sessions, with the theme of “You raise me up - friends forever”. Students had time to socialize during a night market and weekend market fellowship opportunities, and then invite the students to a church service, where one girl gave her life to Christ on her knees weeping before the Lord! Our Thai Christian friends from Bible Church Thailand will follow up on several other students too and continue to build relationships with the Bangkok students. Of course they had some fun times too exploring the canals of Bangkok in a boat, fishing, parasailing and riding on elephants, jet skis, the “banana” and simply enjoying the sun and beaches of the Pattaya islands. The group had enough funds left to bless amongst others the local missionaries with an aircon to be installed in one room of the training center in Mae Sot, as well as fixing a frustrating electrical problem in the church building in Bangkok that had left them with only about 1/8 of the lights still burning. We cannot praise God enough for this exciting growth opportunity for students from all over the world!